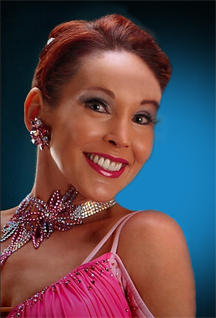 Susie Buck is a professional International Standard and Latin dancer and instructor from Raleigh, North Carolina. Originally from New York, she has achieved her Fellow Degree in Ballroom and Licentiate Degree in Latin from the Imperial Society of Teacher's of Dance of London, England, and her Ballroom and Latin Licentiate Degree from the Canadian Dance Teacher’s Association. Susie is also a registered adjudicator with the National Dance Council of America. Suzie is also a competitive dancer, and has competed in Canada and the United States in Ballroom and Latin. She has placed in the Rising Star Finals at the United States Championships and was one of 10 dance finalists at the 2001 Star Challenge in Canada and Heritage Classic Dancesport Championships in 2005 in the United States. Susie is currently coaching and teaching ballroom dancing to Amateur and Professional dancers. Susie also teaches choreography, competitive dancing, and social dancing. Her passion for the dance shows in her enthusiasm with her teaching. Use the link below to view her schedule of lessons and dance events.